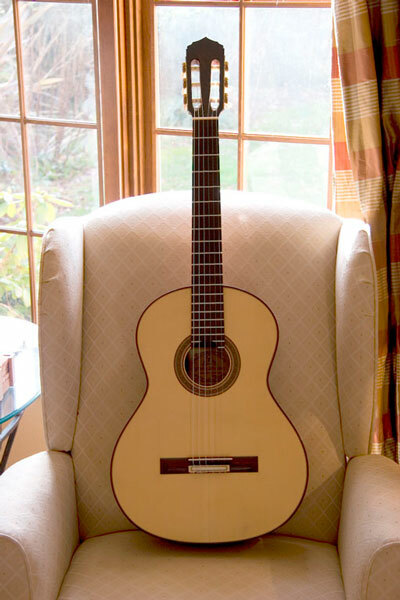 A fter playing cedar instruments for a few years, I have encountered enough repertory to realize the need for a contrasting spruce guitar. 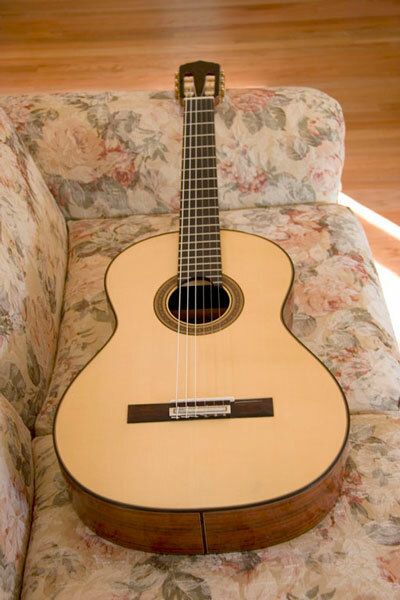 The primary goal is to obtain an ideal spruce timbre with excellent clarity and note separation. The biggest question is whether I want the extra sensitivity and power found in Breslin's double top. 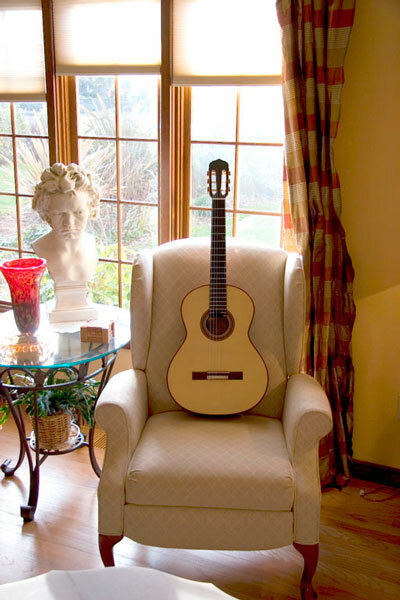 Will Nomex enhance the inherent spruce timbre or move it closer to cedar and blur distinction? After weeks of consideration and discussion with Breslin, I decided to go with another double top. 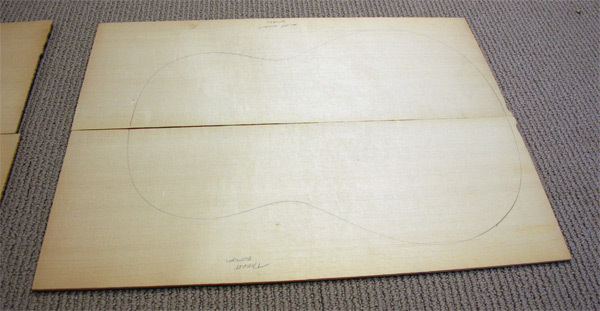 I already adapted my playing technique for the cedar double top, so I decided both guitars should use the design. 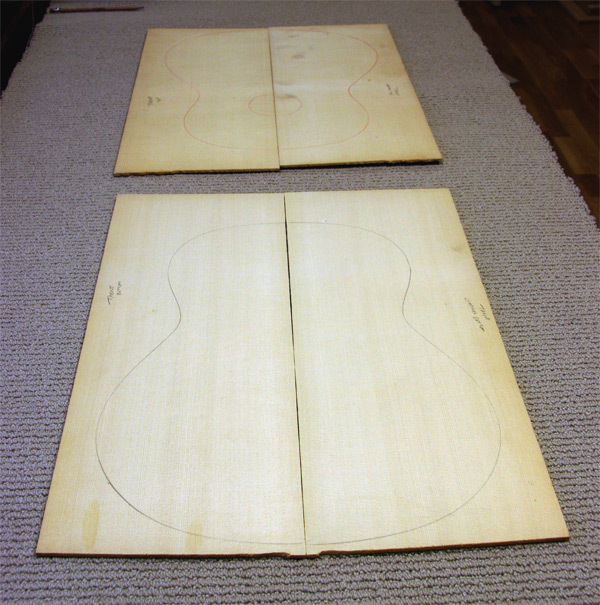 T hese are the two sets I selected for the guitar. 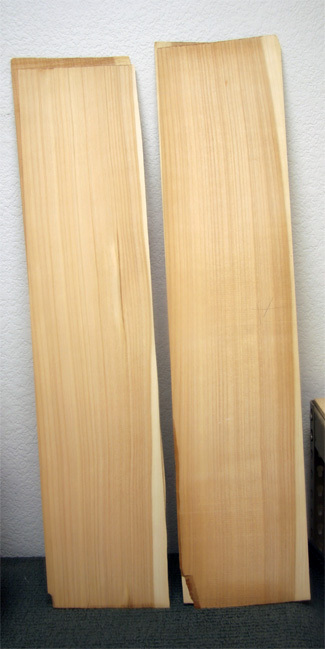 I spent a few hours evaluating Breslin's extensive spruce stock, eventually deciding on two strong Engelmann spruce (Picea Engelmanni) sets. 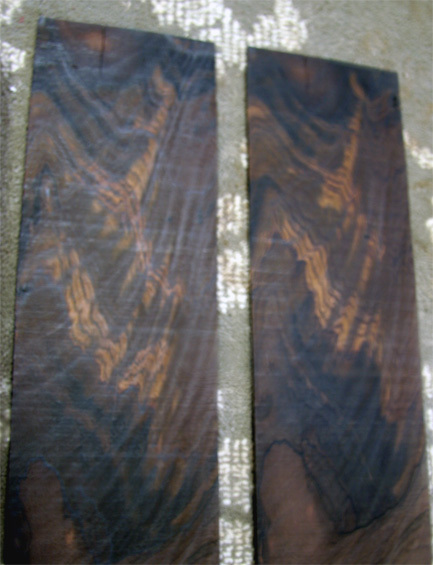 The wood is light, extremely stiff and exhibits very tight graining. 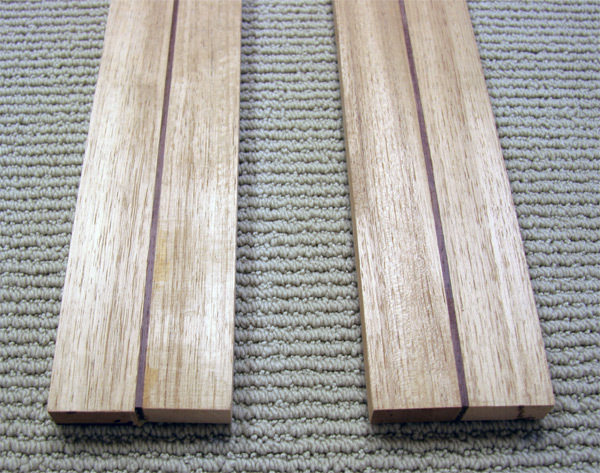 Very fine medullary rays (cross-silking) pervade both soundboards, clearly indicating this wood is perfectly quartersawn. 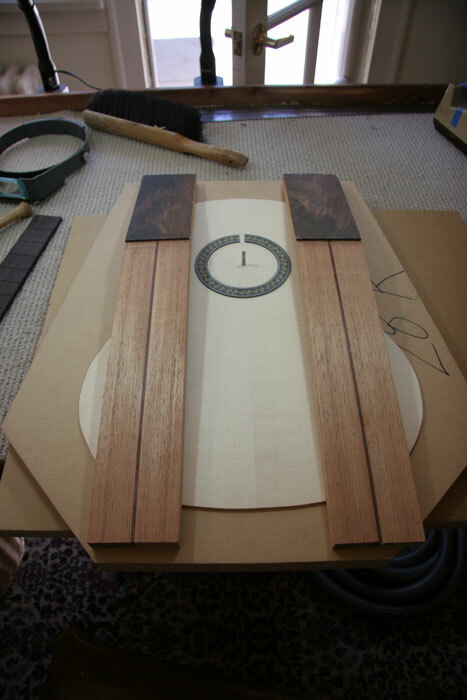 Because of its exceptional beauty, the set with the red template markings will be used for the outer soundboard. 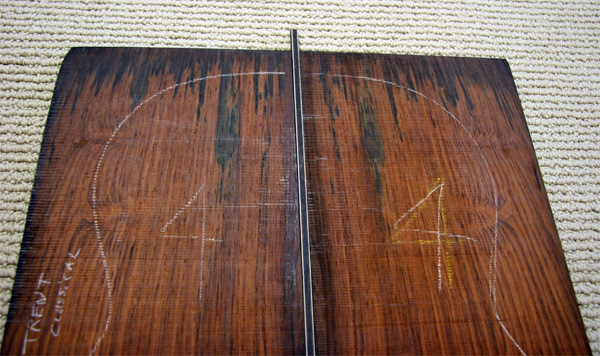 There is no sign of run-out, so the soundboard should bookmatch precisely. 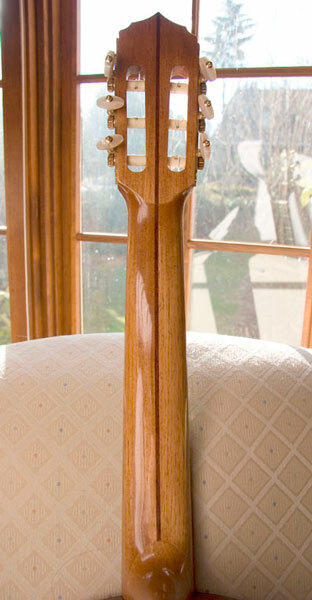 The wood exhibits a pure and consistent ivory color that is truly beautiful. 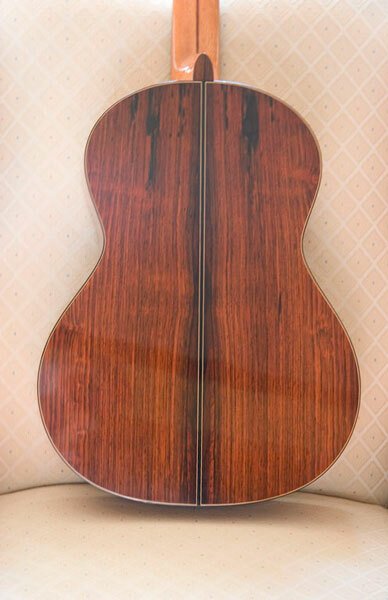 Engelmann will likely deliver a slightly mellower tone compared to the German spruce I also evaluated. 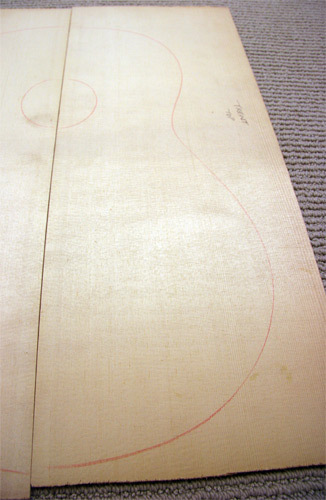 This is the inner soundboard; it will be braced with Engelmann spruce. 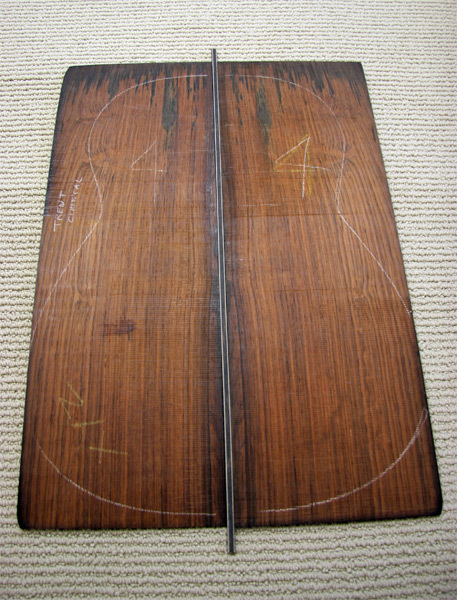 N omex is placed between the inner and outer soundboards. 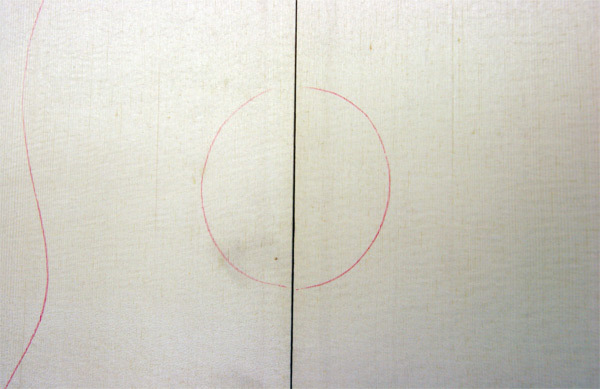 A vacuum chamber is used to perform this join. 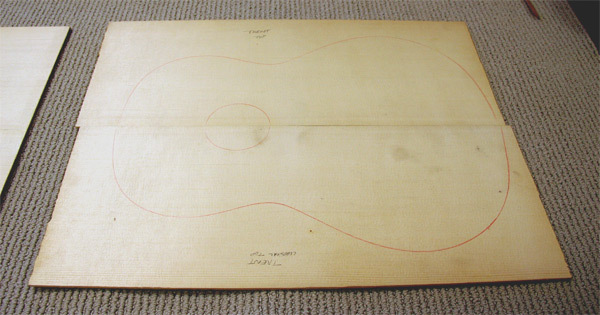 Nomex is a resin-reinforced fiber with a honeycomb cellular shape, making the soundboard approximately 25% lighter than a solid top. 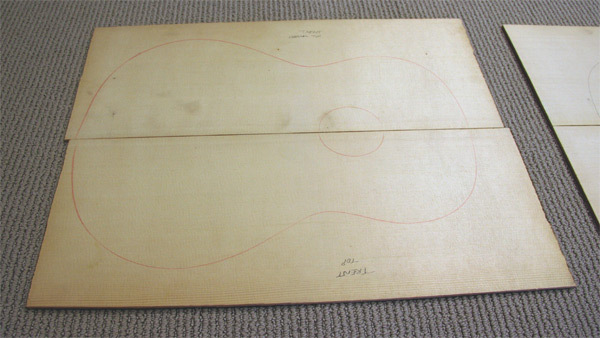 Overall, soundboard composition is 70% spruce and 30% Nomex. 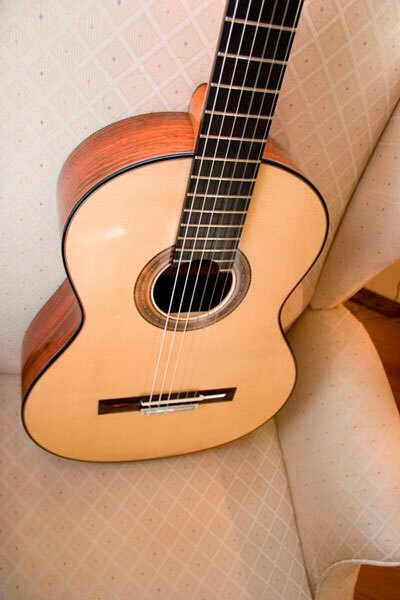 Essentially, Nomex lightens the soundboard and increases dynamic response, increasing sensitivity and amplifying the characterstic spruce timbre. The increase in volume and sustain is impressive. 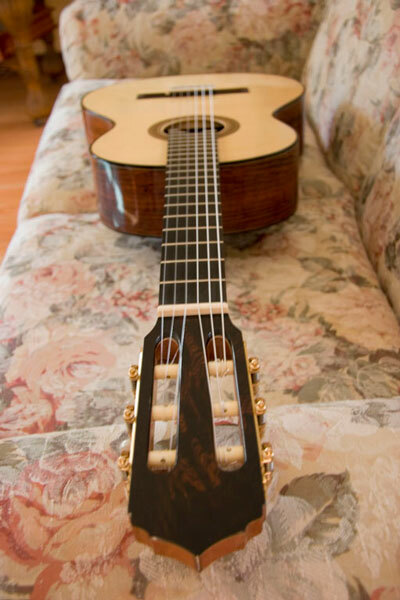 Overtones are more complex and harmonics are intensified. 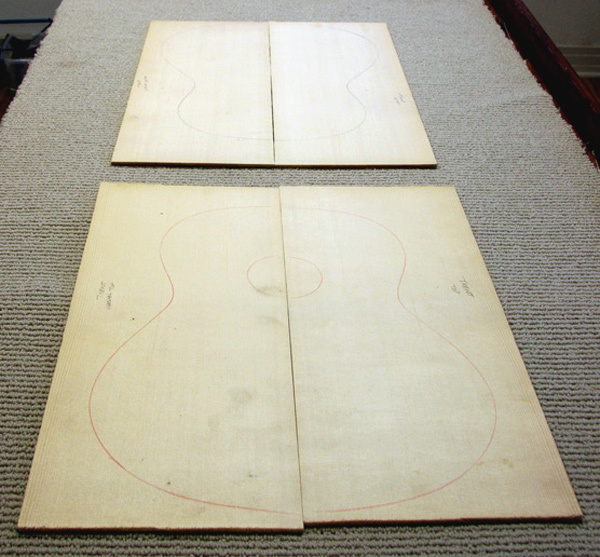 Despite having two very thin tops, the completed soundboard is very durable. 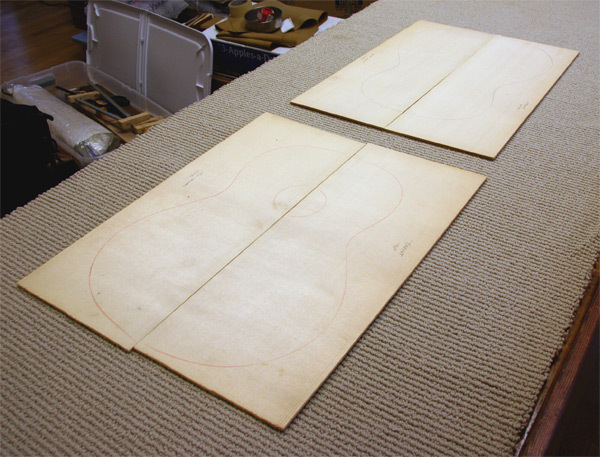 The Nomex cell structure acts as a hexagonal brace, providing uniform support across the soundboard. 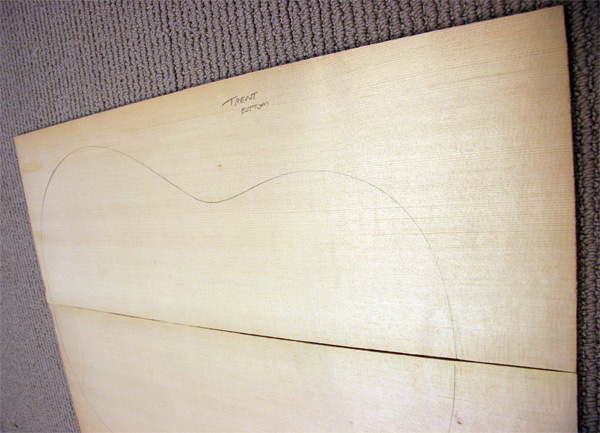 This design withstands humidity changes better than solid spruce. 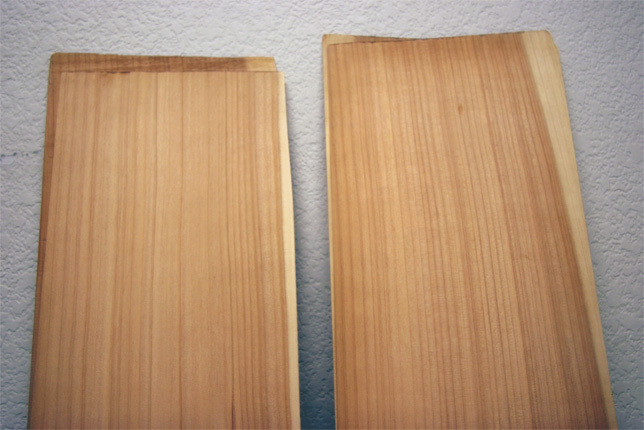 Engelmann is relatively under utilized, mainly because it grows in smaller quantities compared to other spruce. It's simply more difficult to obtain good sets. It grows mostly in the Rocky Mountains, from British Columbia to New Mexico. 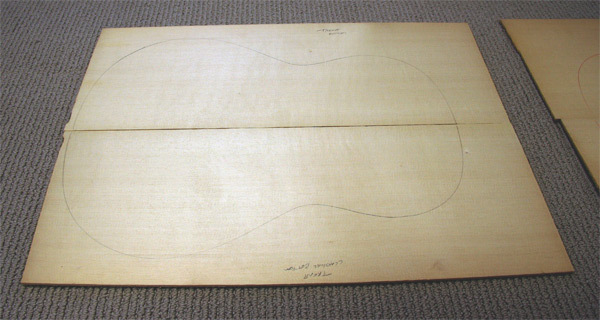 The cold and dry conditions in Colorado slow tree growth, which limits the number of trees large enough to harvest for guitar sets. Trees large enough are usually several hundred years old. Engelmann is certainly a vanishing resource, quickly becoming as scarce as German spruce. M edullary rays (cross silking) pervade the entire set. G raining is consistently tight throughout. 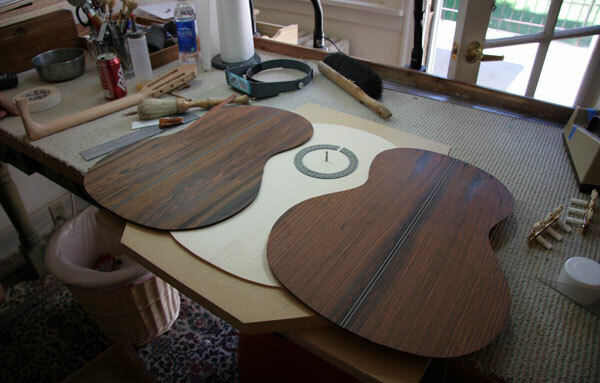 A nother customer's soundboard is pictured here, but I will be using essentially the same rosette. 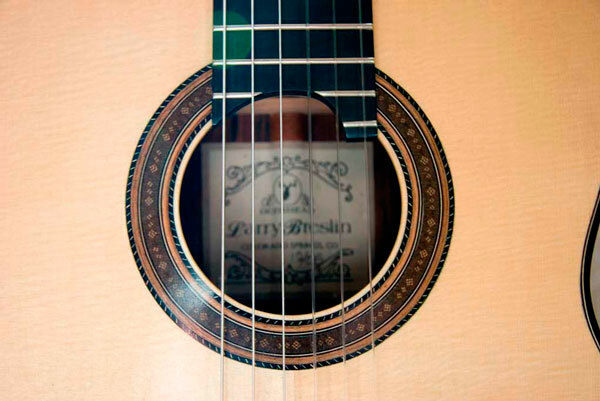 This is Breslin's favorite and latest rosette design, hand made inside his workshop. 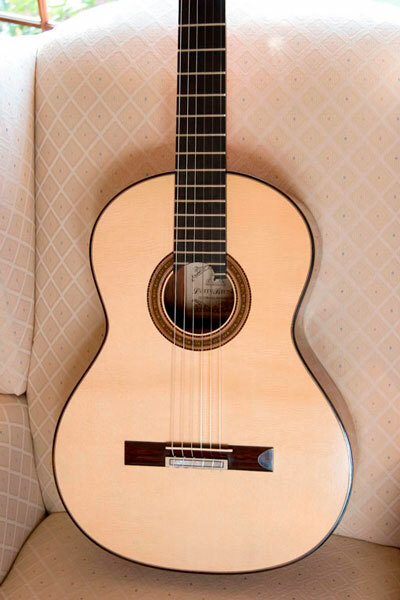 I think this darker rosette works in perfect harmonic contrast with the creamy-white Engelmann. W hat can I say about this very old and extremely dense Jacaranda? 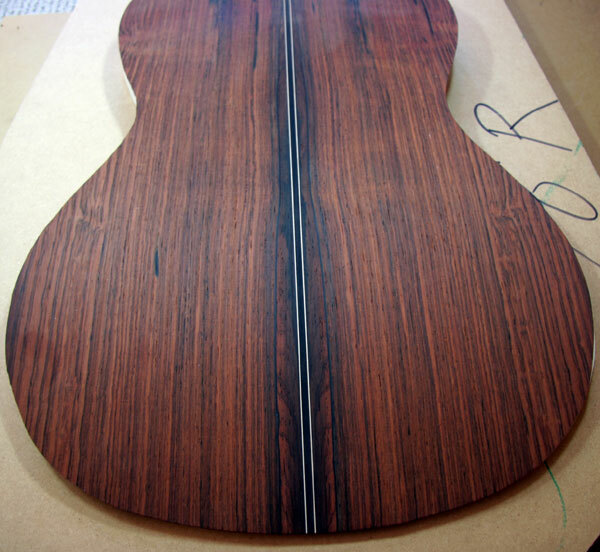 I wanted the heaviest, straightest Brazilian rosewood remaining in Breslin's stock for this guitar. 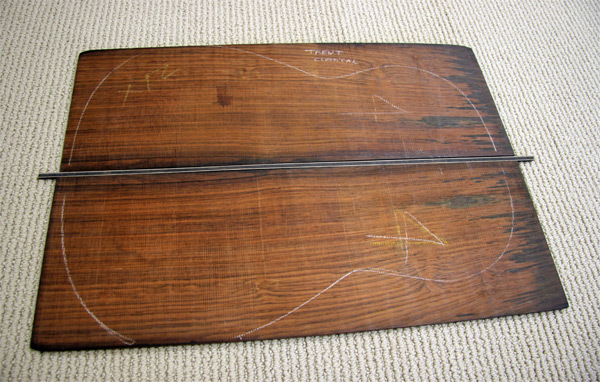 The wood has been air dried in storage for over 40 years. Although not perfectly quartersawn, it is more on-quarter than not. Extremely fine spider web figuration runs along center. D ark ink spots appear in the upper bout area. The unique figuration was likely affected by serveral decades of weathering. 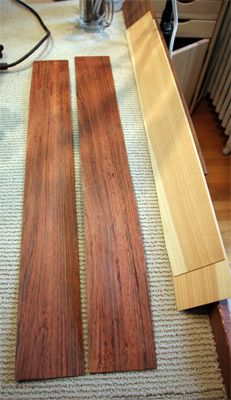 T he wood has a strong reddish/orange tint. 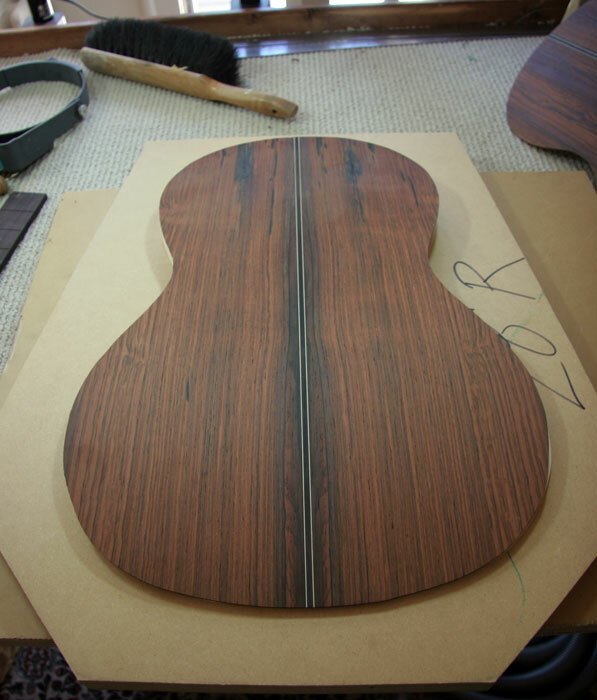 C ypress ribs will be joined with Brazilian rosewood sides. 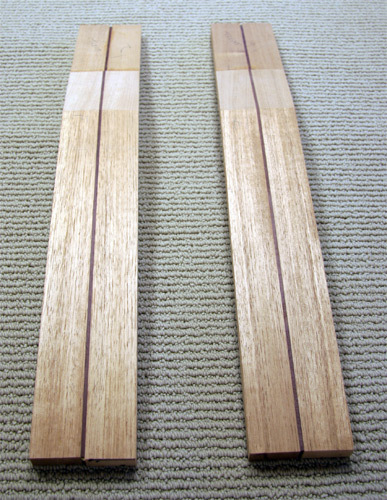 A closer photo of the cypress ribs. 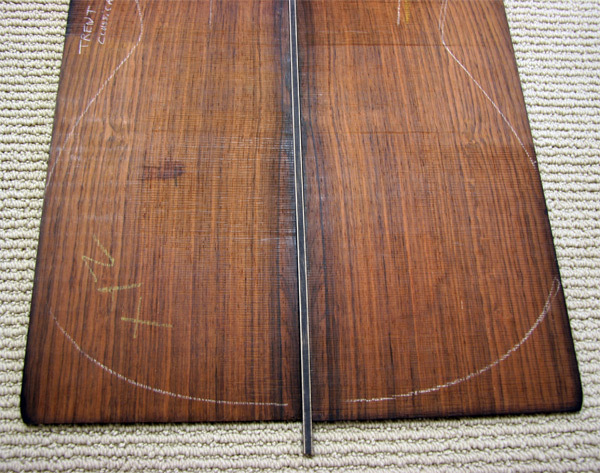 C ypress and rosewood sides are thinned before bending work begins. 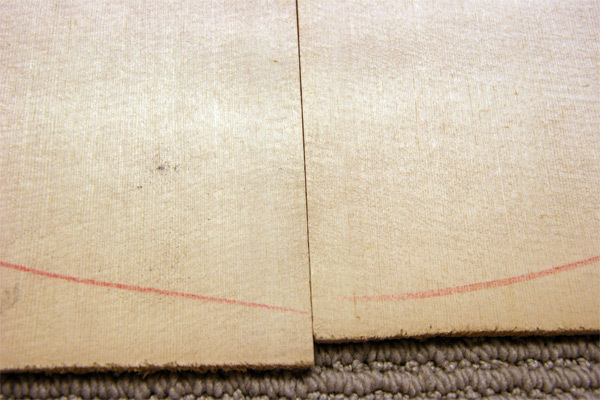 L arry's selection of side wood matches the back set very well, especially the overall red tint. 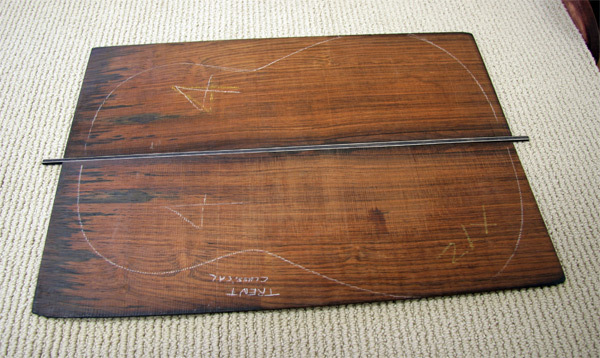 For deeper coverage of Breslin's side-bending process, please visit my side bending page. 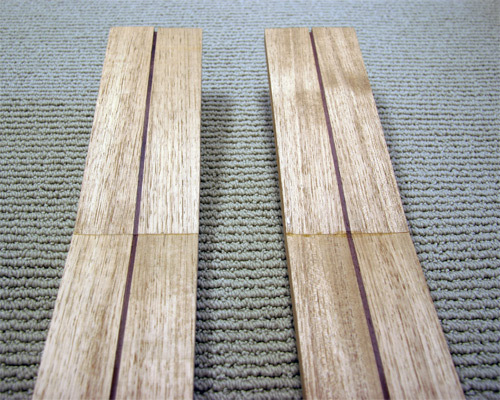 C uban cedar is used for the neck, with a rosewood center strip. This is a recent change in Breslin's design. 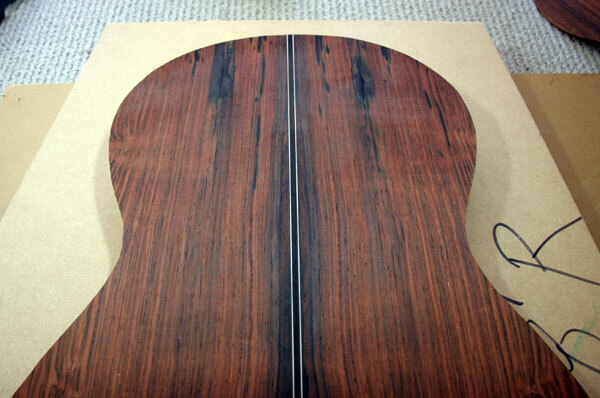 H ighly figured Brazilian rosewood will be used to veneer the headstock. 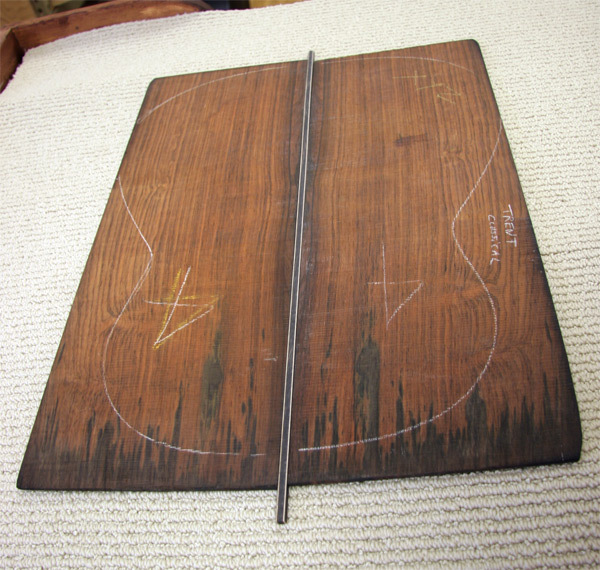 B reslin recently moved to a new 12-hole classical bridge design; this decision required the creation of a new jig. Breslin's body shape has also been revised with new jigs as well; the upper bout is slightly smaller and the waist is a bit more narrow. 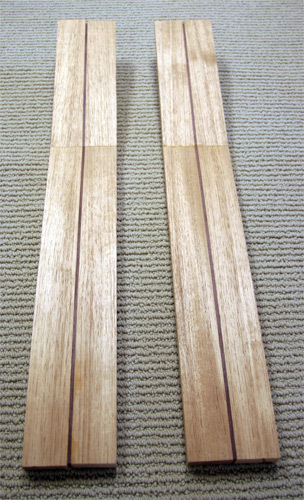 T his tighter shot shows the offset hole pairings. 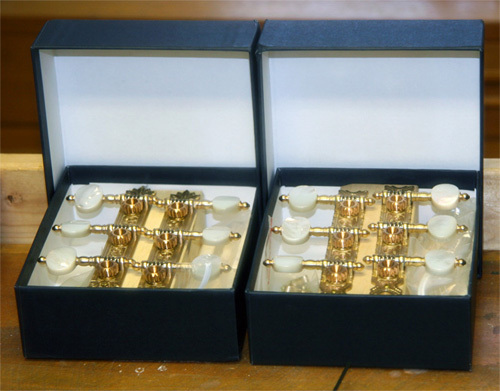 A lessi "Leaves" and "Simplicio" tuning machines are ready to go. 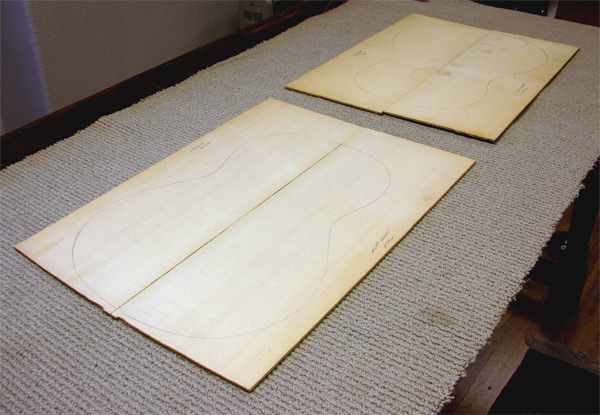 The Leaves model will be fitted to the spruce double top; the Simplicio is for the flamenco negra that Breslin is also constructing for me this year. 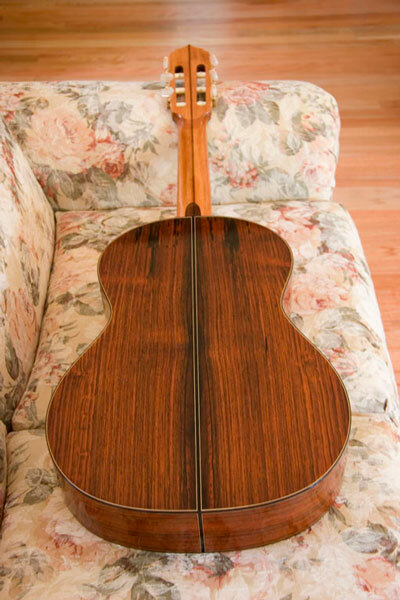 A tight shot of Nicolo Alessi's Leaves model. These are large and heavy bronze plates, with very tight and consistent gear movement. The plate design and engraving are beautiful. 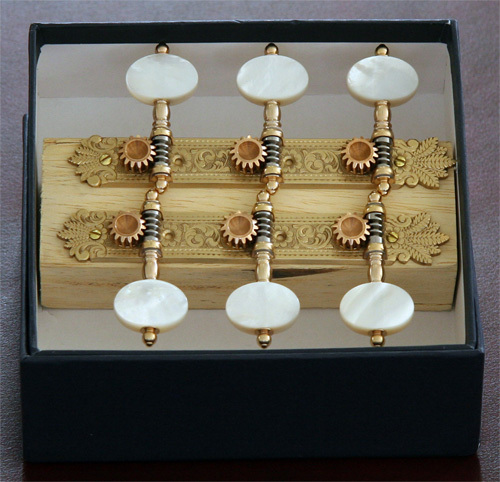 Alessi's mother-of-pearl buttons are the best I have ever seen. 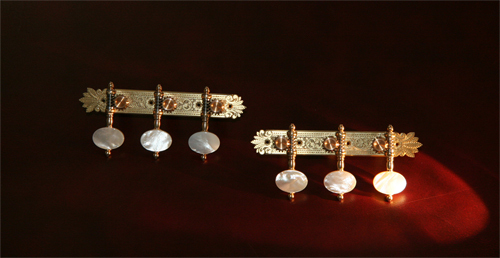 I changed the lighting and contrast to reveal just how beautiful the engraving and mother-of-pearl are. A nother shot of the machines out of their protective packing. 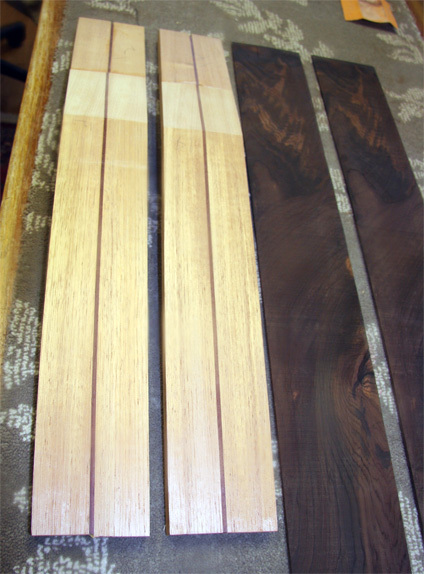 T he wood selection process has concluded. To formally reserve all of this precious material, Breslin had me sign my name on each blank. T he two-year wait was worth every minute! 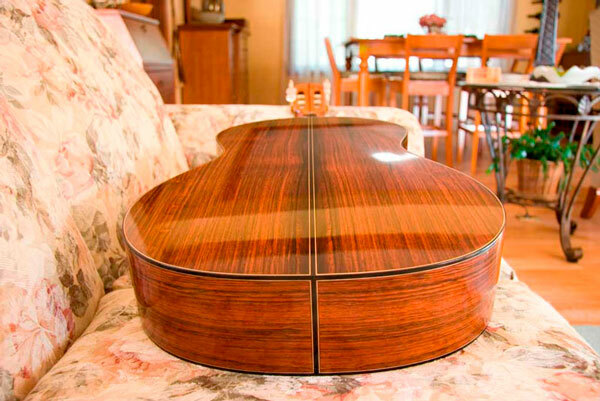 Although the spruce soundboard has not fully developed, this guitar already slightly out-performs my 2004 cedar double top, even though Larry Breslin's latest classical design is a tad more diminutive, with a tighter waist and smaller upper bout. I am shocked and extremely pleased! 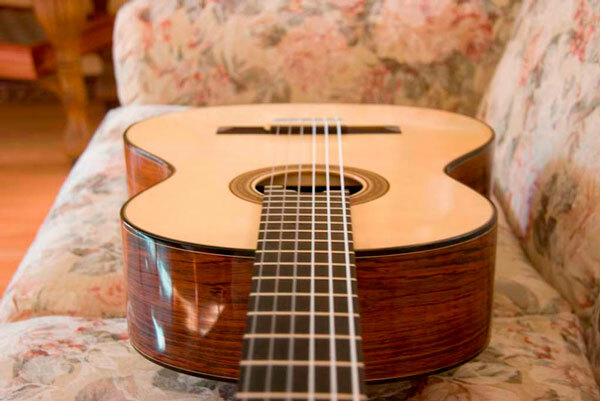 The tapa produces super clean tonal clarity, a brilliant upper register, yet it creates tremendous depth in the bass as well. 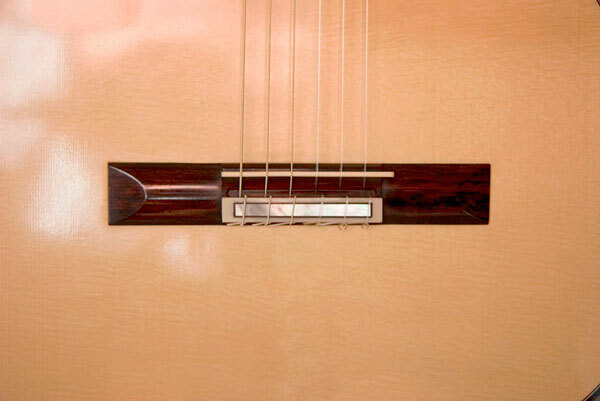 This comprehensive timbre is projected with incredible volume and sensitivity. Fantastic! Once again, thank you so much, Larry! 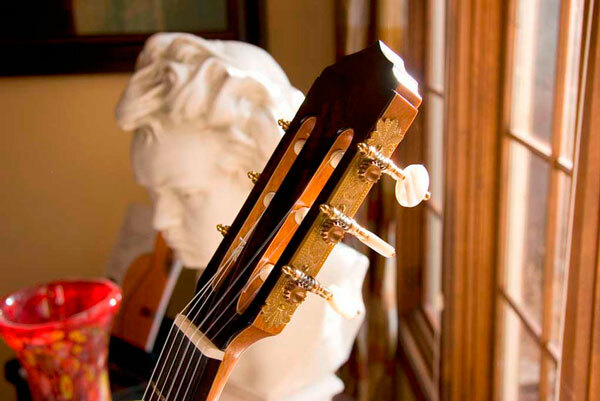 A truly classic profile. 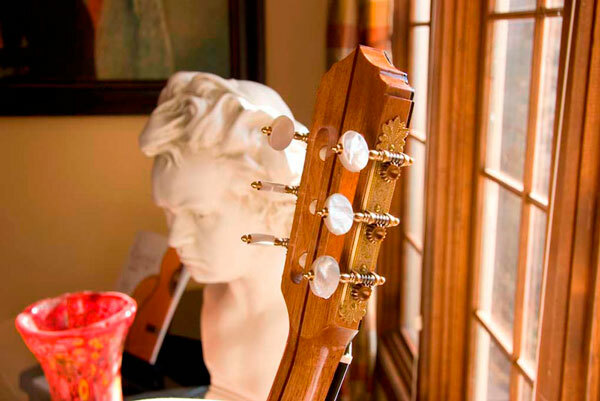 I noticed Breslin's new, dramatic headstock right away. 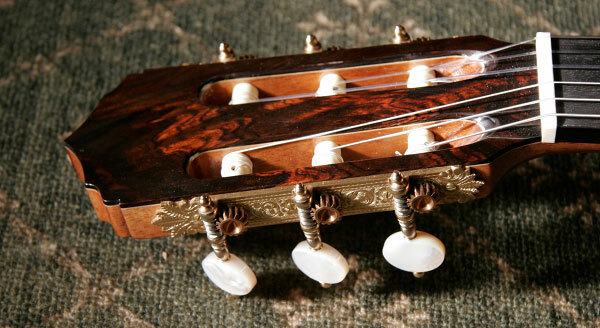 S harp contrasts are found in the wood selection, bindings, rosette, headstock and bridge. An intentional, repeated theme throughout. 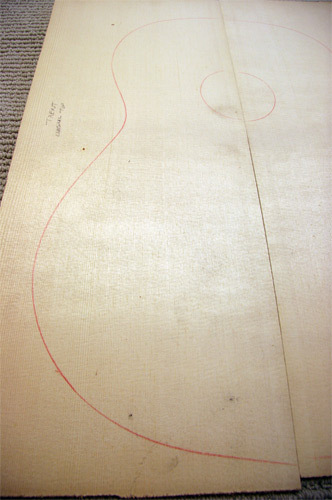 H eavy silking in the tapa is obvious in this shot of the soundhole. 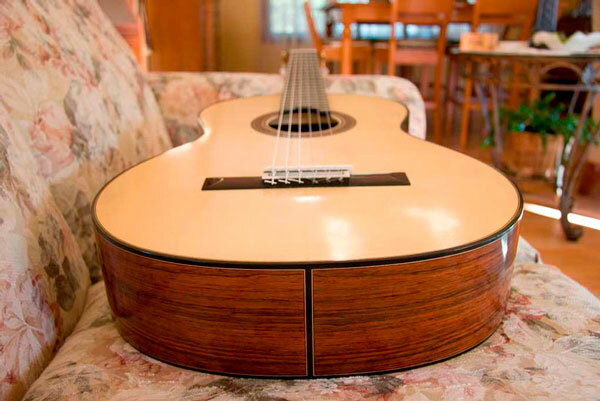 The rosette is Breslin's latest design, and it's totally hand made in his workshop. 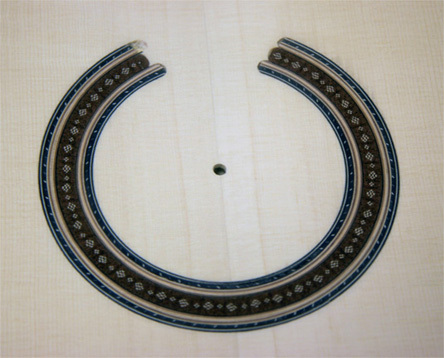 A 12-hole bridge with an "easy lift" saddle (and more silk). 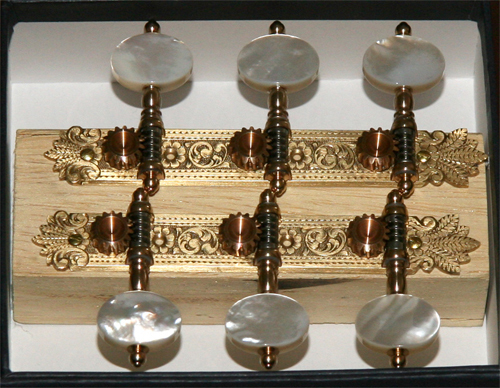 A llesi "Leaves" tuning machines. Nicolo's gears are now standard equipment on Breslin's guitars. 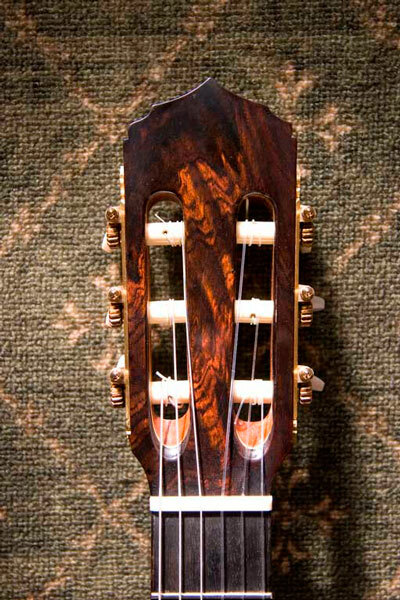 B reslin's new headstock, and I really like the design. 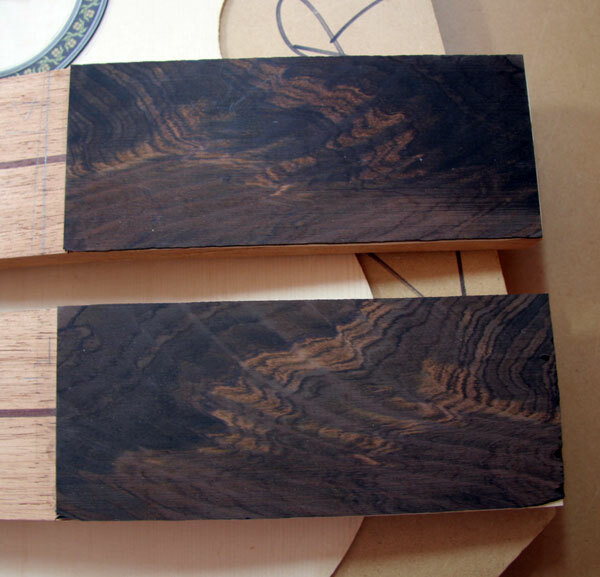 The sharper point is more dramatic, and the overall shape is just stronger somehow. N icolo's gears are now standard equipment on Breslin's guitars. A nother mystery I can't explain is my addiction to ebony bindings. 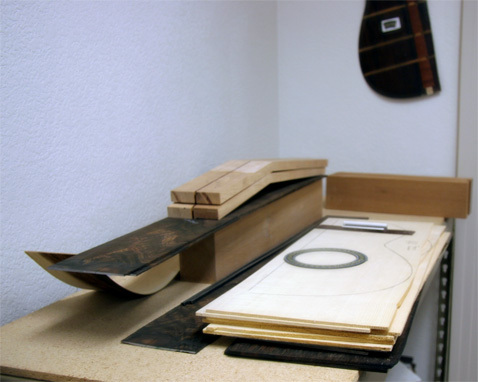 I've used them for every guitar I've ordered from Breslin. Y ou would think I'd get tired of this rather traditional look, but I just love it. 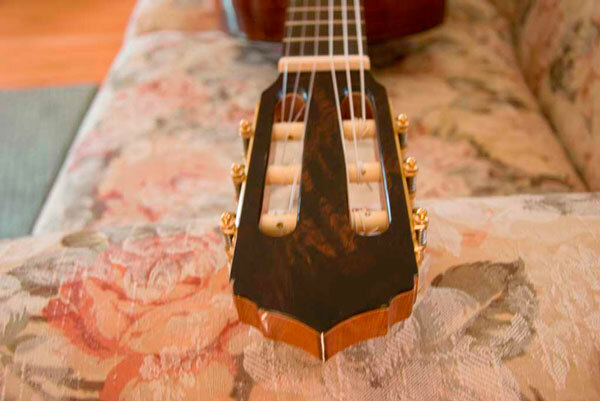 The ebony/maple contrast in the binding is a repeated design motif in many other areas of the guitar, including the headstock, bridge, rosette and the Engelmann/Brazilian wood selection. 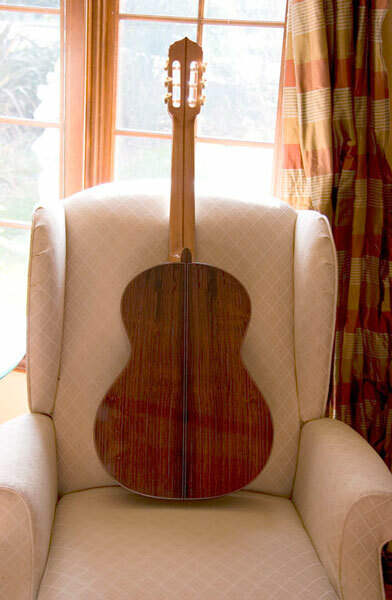 T he strip of hard wood in the middle of the neck adds extra strength in the design. 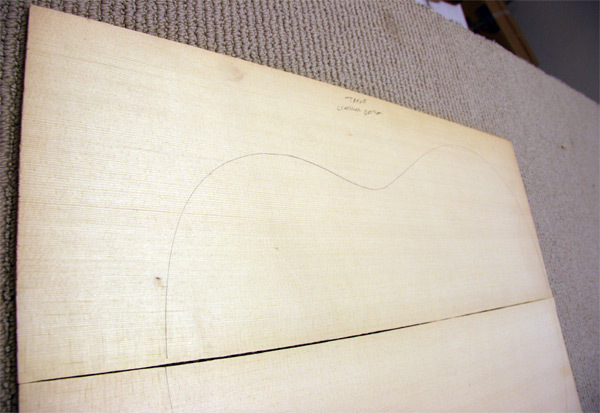 Larry shaped this thin-line (20mm) neck for me, which remains consistent from the first to the 10th position, perhaps the single most important feature that has helped my technique and greatly lower hand stress. 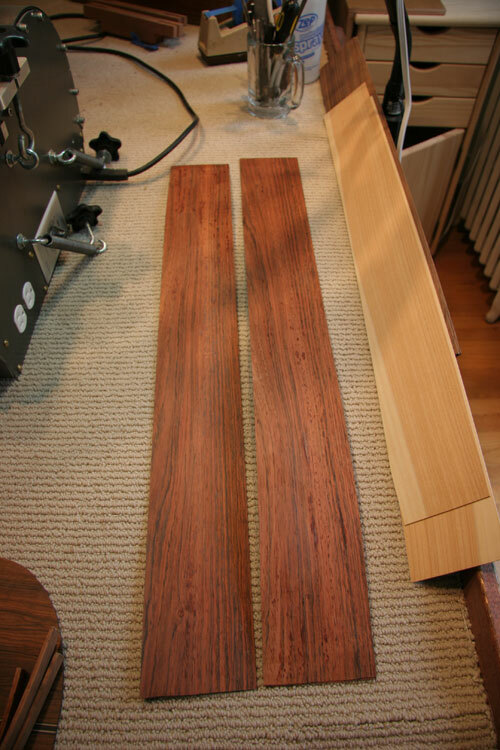 A beautiful dark red/orange tint runs through this very old and straight Brazilian set. 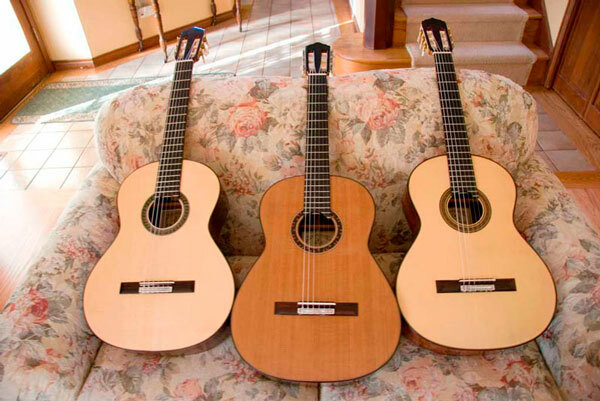 F rom left to right: 2005 flamenco negra, 2004 cedar double top, and 2007 spruce double top.